10" overall length. 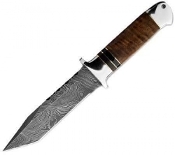 5.3" full tang 256 layer damascus steel tanto blade. Blade forged with 1095 and 15N20 steel. Rockwell of 58 to 60. Decorative jimping like grooves alongs the spine. Bevel compound Grind. Polished stainless guard and bolsters. Burl wood handle scales with G-10 and brass accents. Lanyard hole. Premium leather sheath.